Ok, confession time, lets start with card game collecting. I should not purchase collectable card games… ever…period. I’m one of those people who just have to collect the entire set of card games, even if I’m not playing the game. Although I’ve got to say I’m not stupid enough to do the randomised blind purchase systems like Magic the Gathering (MTG). *cough* I did dabbled in Dice Masters & MTG, but got out quick *cough*. 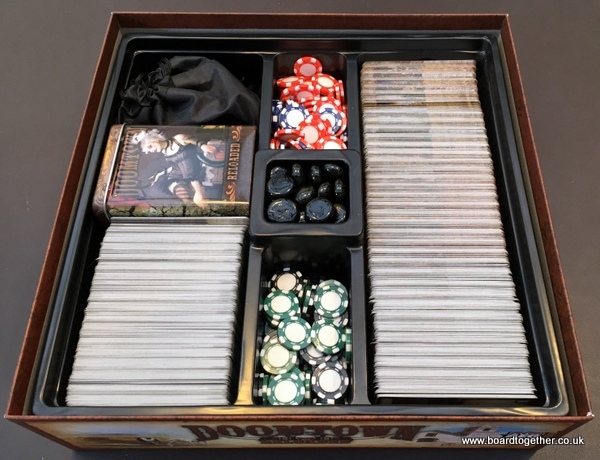 Living Card Games (LCG) have more appeal. Non randomised cards that are the same in every pack makes much more sense to me. Buying pack after pack not knowing what was inside and having a slim chance of getting a good card just didn’t feel right. So I started collecting Netrunner for a while but I wasn’t playing it and now I’ve moved onto Doomtown Reloaded and am not playing that either. These packs are called Saddlebags as the LCG system was trademarked by Fantasy Flight Games. 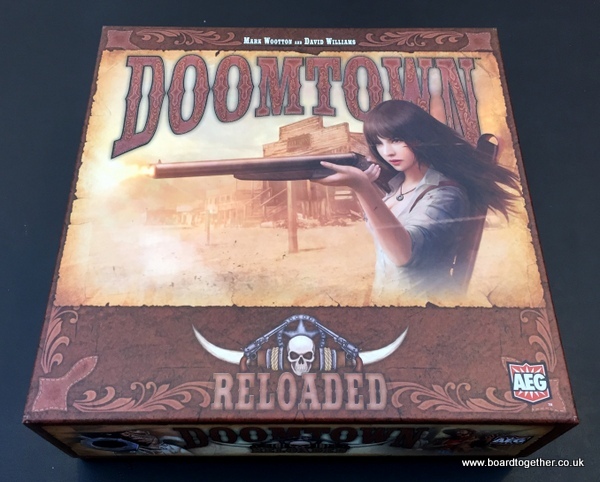 Enough confessions for now lets talk about blinging out games… with Doomtown Reloaded. I love to swap out components in games and adding a little bit of bling. Lets start with the Ghost Rock tokens. 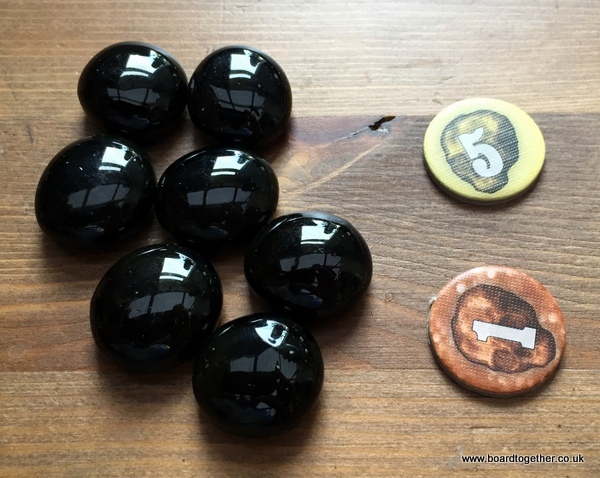 Ghost rock is a black rock that burns longer and hotter than coal and powers a lot of the contraptions in the Deadlands world. Whilst burning, it makes a screaming sound, as if a soul was caught inside and was being roasted alive. 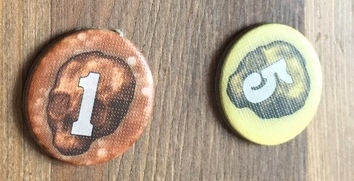 So lets take a look at the tokens inside the game. Ok… not sure what happened there but I’m sure I can do better… to Google! I love glass beads, so swapping the counters out for black glass beads (these were brought from Choas Cards) was always going to happen. Lets take a look at these together. Much, much better, the only problem with swapping out the counters is that you lose the ability to have one token count as 5 ghost rock. So I brought three packets of the black beads for the game. Is having a huge mound of ghost rock next to your deck a bad thing? Nah, it can be quite intimidating to the opponent. 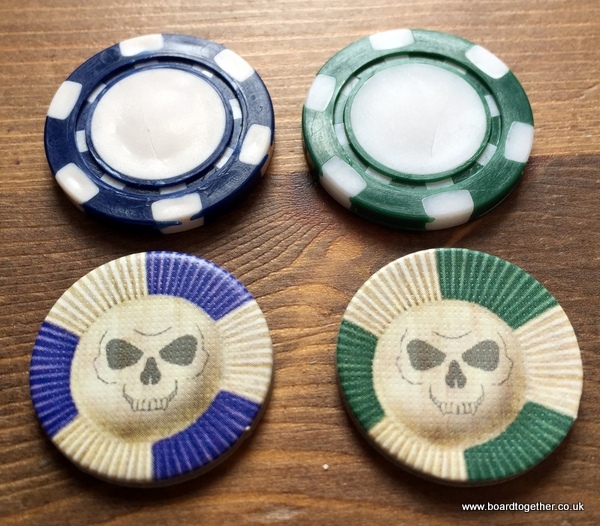 Now for the Poker chips. I have to say a big thank you Waddingtons No.1 Travel Poker set for the miniature poker chips. I tried full size ones but they covered too much of the cards when in play so these miniatures ones are just right and they come in four colours. The quality of these chips are not the best. In fact I would say they’re dire, as some were mis-formed or the coloured plastic had leaked across the white areas of the chips. The price point was also quite high at £14.99. If I had paid full price for this set I would not have been happy. Luckily ASDA had them on sale for £3.75 each, so I brought a couple of sets. So there we go, just a couple of replacements and I think the game looks a lot better. All the original tokens are in the bag at the back which was also part of the Waddingtons poker set. See what I mean about collecting cards… sigh!